Poetry. 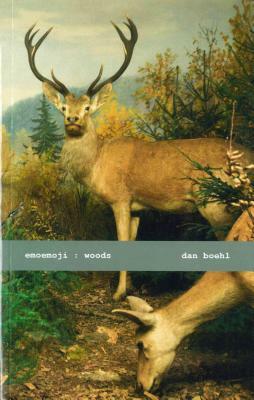 Much like it's predecessor, KINGS OF THE F**KING SEA, Dan Boehl's second collection, EMOEMOJI: WOODS, feels both ancient and contemporary, mythic and ephemeral. Documenting his time at Schloss Solitude, these terse poems every line, just one word unravel the anxiety and disorientation of living in an unfamiliar place and the comfort and freedom of living in that place among artists. By disturbing the nature- centered minimalism of Basho or Moritake with the contemporary urban conversationalism of O'Hara or Creeley, Boehl depicts how the present disturbs the past, how an American disturbs other cultures, and how an artist disturbs the world. But instead of the path of least resistance judgement B oehl treats this with joyful inclusion.